← Do people complain you’re quiet on the repeater? My DXCC count of worked and confirmed stations has been slowly increasing over the last few years and I’ve received QSLs from every entity I’ve worked except for Iran. 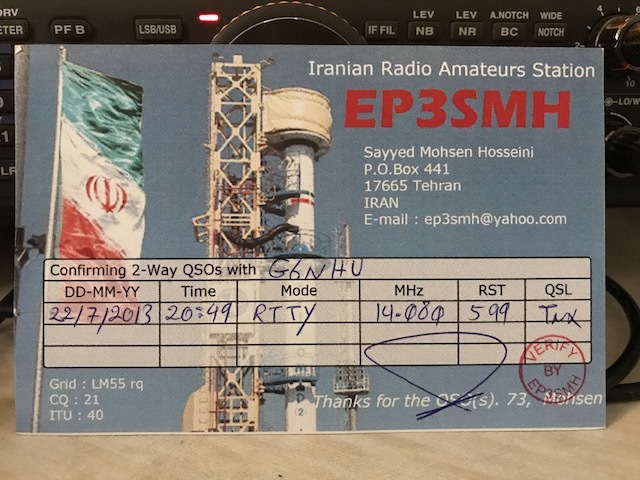 I’ve only made one QSO with a station in Iran and up until late last year, I’ve not chased for the QSL card due to the hoops that station has placed which required jumping through in order to get the card. One of those was to send an IRC and I simply didn’t have any. Someone sent an IRC with their QSL card for GB5RC (despite all the QSL info asking people not to) which had an expiry date of December 2017 so I decided to use that. I sent off my card, an envelope, the IRC and the required number of ‘green stamps’ by registered post at the end of November and last week I finally got a QSL card back. There are many award schemes run by different societies and groups such as eQSL and QRZ but DXCC is the only one I’m actively interested in chasing. It really is the daddy of awards and I don’t think any of the others come close to it in prestige. You can read the original article from 1935 which laid the foundation for DXCC here. This entry was posted in Amateur radio, HF, New DXCC, QSL, RTTY and tagged QSL. Bookmark the permalink.